ducky house | the quacks of Tamara Frampton Vieira: wip completed! Patchwork, patchwork, patchwork, I really adore patchwork. 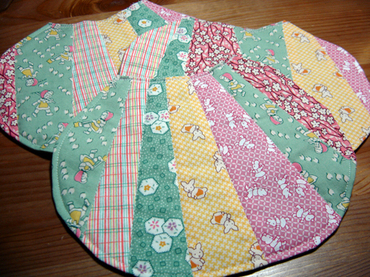 It is such a creative way to combine fabrics and no matter what the project, it never seems to disappoint me. I've been loving this Denyse Schmidt book for forever. She is a master patchworker and she knows just how to put funky shapes and angles to her work. Check out her hop skip jump quilt, it's fabulous. There are so many other patchwork talents out there. 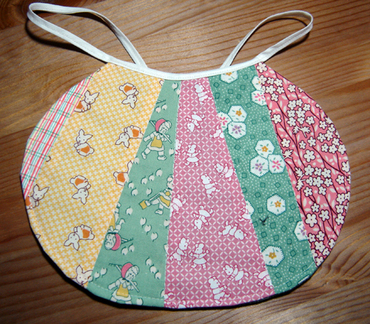 One particular inspiration for these bibs can be found here. After seeing a few bibs that she made and how cute they were, I had to give it a go. fabric that covers the front and a green linen on the back. Can I just say how much I love linen? I couldn't resist this particular shade of green. 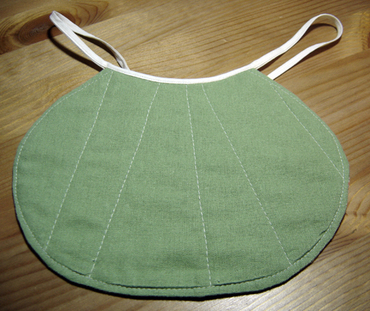 Cotton batting is sandwiched in between and the bib can fit anywhere between infant or toddler. When I took this next picture I still had to finish putting on the ties but that's all done now too and I am completely happy with the way they turned out. I really need to make some more of these.